Our family loved this meal so much, I’m making it for dinner yet again tonight. This was my first time cooking with kabocha squash. I picked up one several weeks ago and it had just been taunting me on the kitchen shelf. The flavor pairs wonderfully with the sweet apple cider. Yes. That’s apple cider in mac and cheese. I got the idea because we were nearly out of almond milk. And you know what? It was really delicious. Something new and admittedly a little crazy. Like my purple hair, I suppose. As I note below, you can also skip this somewhat strange addition and use all milk or a standard mac and cheese experience, veggie-fied. Never tried kabocha squash? The best I can describe is that the taste and texture remind me of sweet potato. * I used these quinoa elbows from Ancient Harvest. 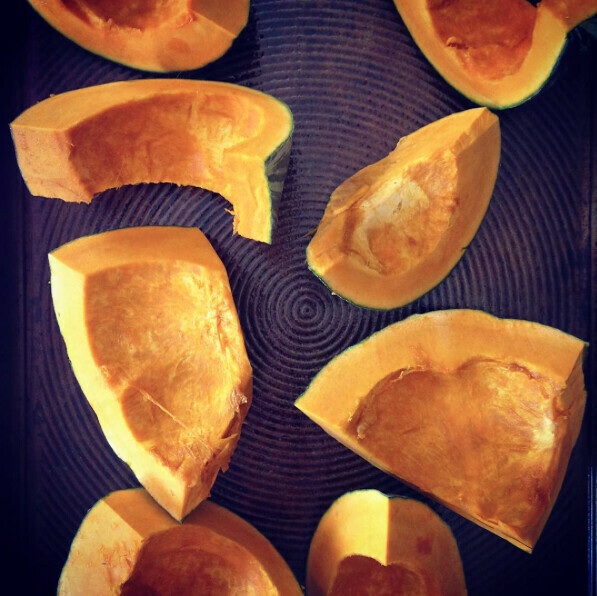 ** You’ll need to roast your kabocha squash, scoop out the flesh, and then puree it with a bit of water. Or sub canned pumpkin or other squash puree to your liking. *** Not adventurous? It’s OK. You can use all milk. The apple cider tastes really fun, though! 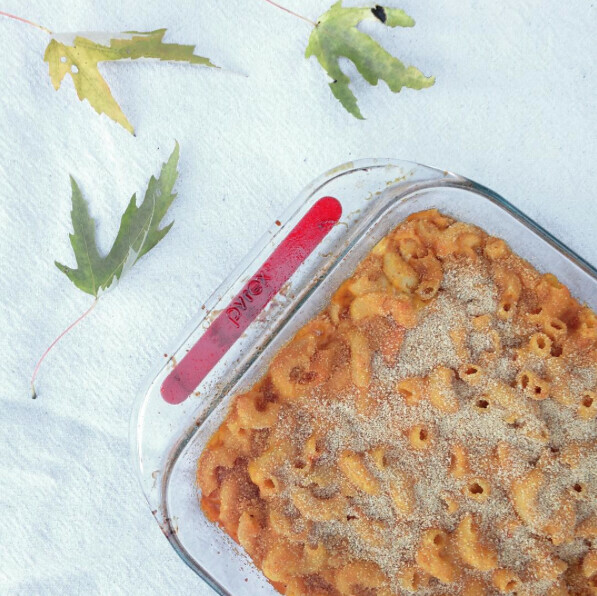 Preheat your oven to 350 degrees F. Grease a 8 x 8 or 9 x 9 inch baking dish and set aside. Cook your noodles to the package’s directions for al dente. You want them done but not mushy. While they are draining, melt your Earth Balance (or butter, etc.) in your cooking pot. Then whisk in some flour and cook for a minute or so. Whisk in your milk and apple cider until uniform. Then add the puree. Once that’s all smooth, start to whisk in the cheese. Keep stirring over low to medium heat until fully blended. Season with the salt, pepper, and paprika to taste. Fold in the noodles with a spatula. Then pour into your baking pan and top with bread crumbs. Bake for 30 minutes -- uncovered -- until golden brown.